United States is planning an anti-satellite test? This is not about Russian forces, but given the recent news about weapons and space, I think it is a question worth asking - Exactly how the planned destruction of the USA 193 satellite is not an ASAT test? And how it would be different from the Chinese ASAT test of January 2007? One important difference is the altitude of the target satellite. The U.S. ASAT test might not create that many debris as the Chinese one did and the debris will decay fairly rapidly. But other than that I don't see a fundamental difference between the two. Besides, if the satellite explodes some debris could end up on relatively long-lived orbits. In fact, we may never find out how many debris the U.S. test will create - it is quite likely that NORAD will keep orbital elements of the debris classified, just as it does with the USA 193 elements. Amateur observers probably won't be able to find them, since they are too small. The Russian space surveillance system will probably detect most of them, but Russia does not publish its data. Overall, I think that shooting down that satellite is an extremely bad idea. I am sure the U.S. official line will be that it is all done for safety and other peaceful purposes, but for all practical and political purposes this will be an ASAT test. Initial reports are the Pentagon will “soon” have a press conference to spell out the situation and present the case for a “shoot down”. I’m sure the safety concerns of having such a “large satellite” falling to earth will be played up and comparisons to the recent Chinese ASAT strike discounted. I believe such a strike will be taken from a US Navy surface warship, probably one of the cruisers or destroyers equipped with the latest Standard anti-missile systems. Some of the initial reports I read about this satellite is that it was a US "spy" satellite. By destroying it and not allowing it to fall on its own, they are preventing loss of sensitive information. I'm sure that they will try make a case - safety, sensitive information etc. But I don't think it matters - ASAT testing would create a bad precedent no matter what the cover is. Welcome to the 21st century everyone. Why is anyone surprised by this? I happen to beleive the US position about being for safety and security reasons, but I'm sure the 2nd and 3rd order effects are bonuses. It sends a message to the Chinese and Russians that the US can 'do it too'. It might be a way to spur talks as well. No matter what happens, I don't see this fundementally changing strategic balances/inbalances not do I see it as a start to another arms race. If someone can afford to make an ICBM, they can afford to make an ASAT. As Pavel wrote, it is most likely the experimental NROL-21 (USA 193)satellite launched abord a Delta 7920-10 in 2007. Most likely it is using a SAR system. The mass of the satellite is about 4 t.
Interestingly, at that time they said the reentering satellite is no threat to anybody. What bad precedent would it make? The precedent was already made by the Chinese tests and their declaration of the space over their country part of their territory. Who is China's biggest competitor? As the fastest growing economic superpower, they have a name to make and something to prove. Our "test" shows them that they do not have complete control. That is the game we play in deterrence. Nothing different then placing multiple CVBG in the Gulf and conducting exercises off the coast of Iran. Yes they did say it was not a threat to anyone...but they also said that it was just launched 6 months prior to losing control and was a classified satellite. 1) Conspiracy theory: Launched for this exact purpose and losing control is the cover story. 2) Don't really know where it will land and has some sensitive information on it. Sorry, NROL-21 was launched on 14.decembre 2006, not in 2007. I´ve looked in the archive, so the first reports that NRO can not contact the satellite are from mid january 2007, one month after launch. Unfurtunetely, the Reuters article of that time is not available anymore. 1) Theory one is not likely I think, a Delta II is extremely expensive (at least 60 Mio). For that purpose they would have used a Minotaur to launch a small satellite in size like NFIRE I think or used an existing satellite like the Chinese did. Faking an malfunction on an old satellite is cheaper. 2) Safety concerns are also unlikely, there is always coming down stuff of that size. Some months ago there was the spectacular reentry of an Soyuz upper above North America stage an big issue in the media. Or think of the Columbia disaster. About 80 t came down above an highly populated area. I think they just taking the chance to show there capabilities and making the best of the loss of a brand new multi Mio satellite. And making sure that no sensitive technology lands in wrong hands (but as the Boeing issue of the last days show, I think they already have the blueprints of the satellite in China :-) ). What about Russia and it's ASAT capability? Does it still have one after the SU collapse? Rich: The bad precedent of conducting an ASAT test. One would hope that after all flak that China got for its Jan 2007 test it would be a norm that "good nations" don't do ASAT tests. I just don't see how anyone (U.S. included) would benefit from breaking that norm. I think SM-3 has atitude range of 160 km and even with its EKV vehicle does not represent ASAT weapon because military sats for sure have higher orbit. I think this is just another SM-3 testing ... nothing to do with true ASAT capabilities. > Exactly how the planned destruction of the USA 193 satellite is not an ASAT test? - Practically, it's NOT the TEST. It's a 'force demonstration'. > I believe such a strike will be taken from a US Navy surface warship, probably one of the cruisers or destroyers equipped with the latest Standard anti-missile systems. - Yes, it looks like SM-3 and Aegis 6.1, may be with some additional rigs. > What bad precedent would it make? The precedent was already made by the Chinese tests and their declaration of the space over their country part of their territory. - And now imagine: after this 'Chinese declaration', Russia will make the same declaration (for example, - that 'outer space over the Russian territory up to geostationary orbit is a part of Russian territory'). So would we prefer to begin 'Star Wars' - and loose such a powerful instruments of arms control, like spy satellites? The only reason this is even a possibility is because they're going to take the shot when it's MUCH lower than any operational satellite. SM-3 wouldn't have a prayer on it's luckiest day against one sitting in orbit. Frankly I'm amazed anybody cares as it's far better to have at least SOME control as to where it comes down rather than roll the dice and have it land on a city somewhere. Is anybody seriously argueing that we just sit back and see who gets lucky? According to General Carwright the intercept will occur at 240 kilometers. Velocity will be 9.8 km/s, suggesting a head-on collision. > So how long do you think it is before the Russians do their test? Iranians can barely get their own missiles off the ground without the help of the Russian and Chinese. I REALLY think Russia will test within the year. Putin will have to prove that Russia can 'hang' with the Americans and Chinese. Is Russian IS-MU operational ? Or perhaps Naryad project. Very interesting writeup by someone who was there back in the day. Yeah, thank you! Very interesting. The primary difference is that this is a real satellite that could cause real problems if it lands. it is possible that this could be considered justifiable circumstances to try to shoot down a satellite in peace time, the equipment modifications are not replicateable through out the fleet. In other words this is a real honest to goodness emergency and as this spacecraft is capable of harming people and property if it crashed, this is not not an ASAT test, this is actual operational emergency launch of a system adapted for the operation. “Damned if you do, damned if you don’t”. > Iranians can barely get their own missiles off the ground without the help of the Russian and Chinese. 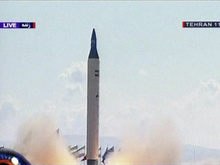 - In 2008, they plan also to launch a first Iranian satellite named 'Omid' ('Hope"). Yeah. All this talk is about a successful hit. But suppose the missile actually misses the satellite: even if US initiate self destruction, wont it create even more debris in low orbit? Also, what is the success chance of a sucessful self destruction? Because if the missile fails to destruct, i think the problem will be a whole lot worse, wont it? The technology used in the US shoot down of the Defense Department satellite is based on a kinetic kill. There is no explosive warhead used and thus no “self destruction” possible. The kinetic kill vehicle is designed to actually strike the target and destroy it by the speed of collision.